No British Christmas would be the same without the traditional and favorite Christmas pudding. 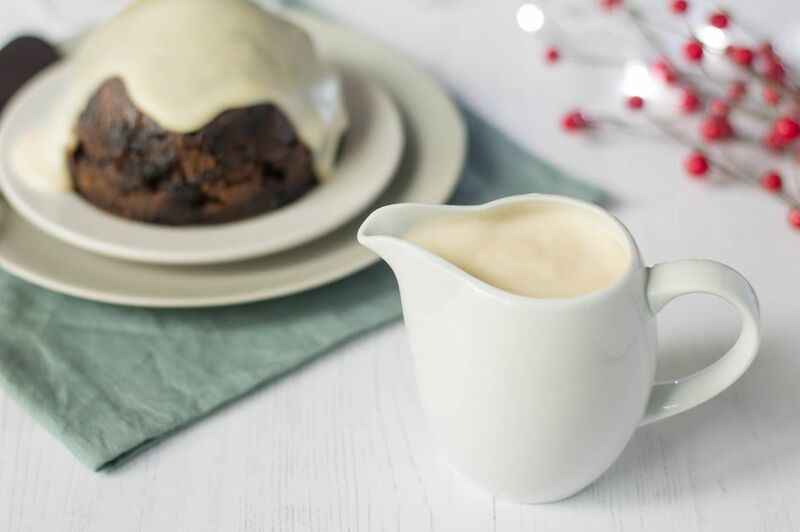 There are various sauces that work well with the pudding, including this delicious, the most traditional of all, Brandy Sauce. The Christmas Pudding works really well with a boozy, rich sauce which is a perfect balance for the pudding. Always use the same liquor in the sauce that you have in your pudding to get the best marriage of flavors. You can, if you prefer, substitute Rum, for the Brandy, it is a matter of taste and what you have in your pudding. Classically, though, Brandy is the flavor. Whichever you choose, both are also delicious. This Brandy sauce recipe is so easy to make and can also be made a day or two in advance and refrigerated then simply reheated when the pudding is ready. If you really like it with a kick, add an extra splash of liqueur right before serving—only for the adults, though. In a nonstick saucepan over a medium heat, gently melt the butter. Once melted, add the flour and stir quickly to create a thick, smooth paste. Cook for 1 minute taking care not to burn. Using a hand whisk, slowly add the milk, stirring vigorously. Continue whisking until a thick smooth sauce is formed this will take 3 to 5 minutes. Take care not to have the heat too high or the base of the sauce may burn. Once the sauce is formed, add the sugar and whisk a little more, until the sugar is completely dissolved. Lower the heat and gently cook for 5 minutes, stirring from time to time. Add the Brandy or Cognac, whisking into the smooth sauce. The sauce can then be cooled and kept covered in the fridge for a few days, so great for planning ahead. On Christmas Day, simply reheat on the stovetop or in the microwave. Add a tiny drop of Brandy or Cognac to liven up the flavor. Once you have flamed your pudding, serve the sauce poured over the pudding. Leftover sauce, just like the pudding reheats very well and a great treat on Boxing Day. Simply reheat the sauce in either a saucepan on the stovetop or in the microwave. Take care not to burn. This sauce does not have to be kept just for the Christmas festivities. It is a good basic sweet, white sauce and works well with many flavorings, both alcoholic or non-alcoholic. Do not serve to children. If you have children at the lunch offer them custard, ice cream, or make a plain white sauce. Chocolate and Cream Swiss Roll is not Easy to Make but So Worth it.